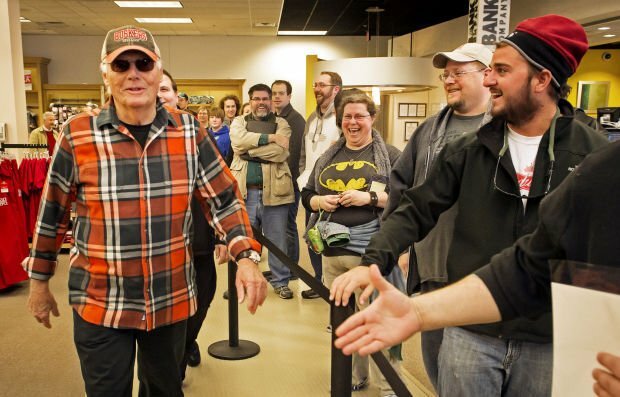 Batman fans react as the original Batman, Adam West, enters Nebraska Bookstore to sign autographs on Monday. 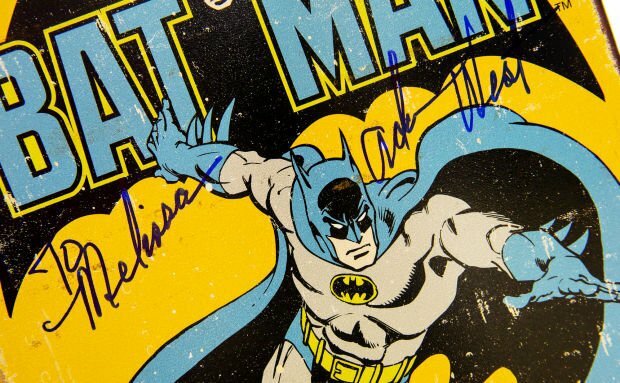 The original Batman and current spokesperson for Neebo, Adam West, signed autographs for fans, including this vintage metal poster, at Nebraska Bookstore. LINCOLN — On Monday, Larry Meier and Mark Yost stood in a winding line with matching Batmobiles and similar childhood memories. "You gotta admit, it's a cool car," said Meier, who was 13 when "Batman," the TV series starring Adam West as the Caped Crusader, debuted in 1966. "It's still cool today." Plenty of people feel the same way about West, if the long line at the Nebraska Bookstore Monday afternoon was any indication. West, 85, paid a quick visit to Lincoln as part of a sponsorship deal with Neebo and spent the afternoon signing autographs at the Nebraska Bookstore and fielding questions at the Rococo Theatre. "If you're honest and you have a sense of humor about yourself and so on in the world, you can get along just about anywhere," he said. You'll find a few more life lessons in this edited, condensed Q&A West did with the Journal Star during a phone interview last week from his home in Ketchum, Idaho, before he headed to Lincoln. The composer of the “Batman” theme music, Neal Hefti, is from Nebraska. Was he ever around when you filmed the show, or was the music the connection between you and him and “Batman”? He came around once, but when you say music was the connection you're absolutely right, because I'd been a huge admirer of his and Nelson Riddle and all these people you know, great arrangers, and the whole jazz category is just something I listen to a lot. Did you have any say in the show’s music? No. They asked me, “Do you approve?” And I said yes. I think it's immensely memorable. When the Batmobile moves in its own funky style, the music works with that too. Do you still get the song in your head? I've tried to forget it. It's almost impossible because I hear it so frequently! People come up to me in airports singing it! Nanananananana. I'll just say, “I'm on a case." You starred in the pilot for “Lookwell.” (The 1991 show, written by Conan O'Brien and Robert Smigel before they went on to bigger things, follows the washed-up star of a '70s detective show, “Bannigan,” as he uses his acting skills to solve actual crimes that no one wants his help solving. The one episode is loaded with lines like this gem when he’s asked to leave a detective’s office: “Very well then. I’ll be out of your way. But remember this, gentlemen, I have a lot of free time.”) It seems like it might have had more success now as a lot of comedies have gotten rid of laugh tracks and embraced absurdity. AW: It's the one pilot I've done out of maybe 12 that I really wanted picked up. It was really fun and a different kind of comedy. Conan O’Brien and Robert Smigel wrote the script and, I don't know, they thought somehow we had the same comedic sensibilities, I guess. I find it enormously funny … in an absurd way. And it would give me a moment to make fun of myself, too. That's how it happened. I read a few lines and they saw that I immediately understood their intent. You clearly don’t mind taking shots at yourself. Have there been times when you’ve thought a line has gone too far? AW: There have been several times of course with “Family Guy.” The challenge, you start to cook with it. And if you're an artist, I think maybe it's a challenge. How can I do this line without it being terribly offensive and yet funny and people knowing that it's an assault on your dignity, but you're making it work? Since you're in town to promote a bookstore, what are you reading these days? AW: I'm reading a book called "The Intelligent Investor" because of what's happening in the world, globally, with our economy, and I really would like to know more about it. And I just read "Foucault's Pendulum" again, trying to figure that out. I just read -- magazines, books -- because I'm lonely and afraid up here in the woods!